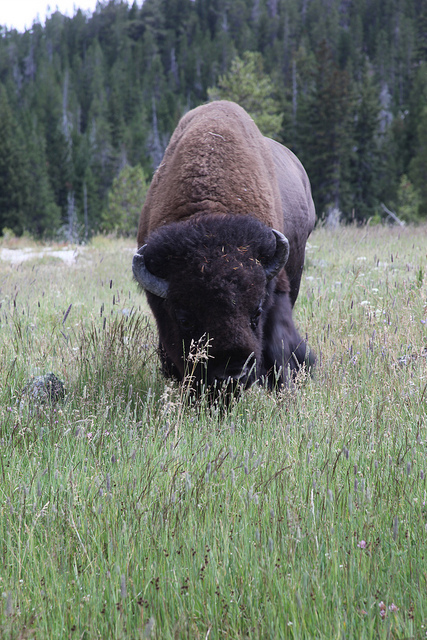 Bison grazing in Yellowstone National Park, Wyoming; photo by Sarah Arnoff on Flickr (noncommercial use permitted with attribution / share alike). The Forkwood soil series consists of very deep, well-drained soils used principally for livestock grazing and wildlife habitat. The native vegetation consists of big sagebrush, bluebunch wheatgrass, Sandberg bluegrass, and needleandthread. Forkwood soils are in nearly-level to gently-sloping areas at elevations of 3500 to 6000 feet.